The finish is always the best! Especially when the struggle was real! 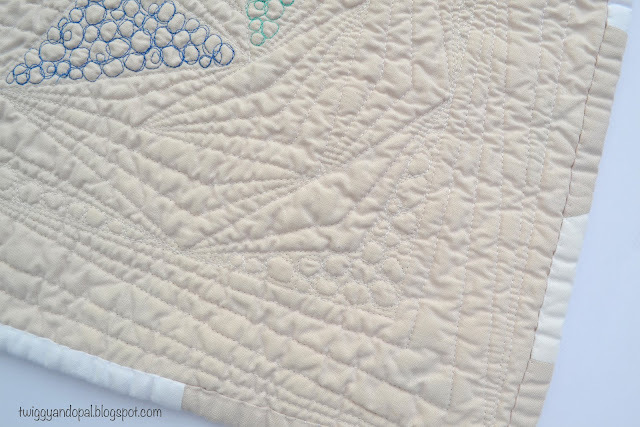 No bones about it...free motion quilting is difficult, yet it draws me in and keeps me coming back for more. When I first finished this top (Evening Star :: Sparkle & Sass), I didn't have a concrete idea how I would quilt it. The possibilities were there...medallion, pebbles, geometric. A triple treat, a trifecta! I knew there would be a lot of thread colors and changes involved, because how could I not?! It's a rainbow! My go to thread is Aurifil 50 wt. and the rainbow colors are Natural White #2021, Lobster Red #2265, Neon Orange #1104, Canary #2120, Bright Pink #2425, Spring Green #1231, Delft Blue #2730, Jade Green #1148,Medium Lavender #2540. The first order of business was pebbles. I marked off the sections in between the triangles and began the pebble power. I'd be kidding myself if I said I'm good at consistent and decent circles. This was the first time I had machine problems and more than once per section I had thread breakage. I persisted because...as a women...that's what we do! I added a few double pebbles for the surprise factor. One thing about pebbles, they look amazing and especially after a good wash & dry! You can't see it very well on the front, but in each triangle I quilted a different design. Straight lines, geometric...I kept it simple. Okay, now the scary part. I attempted my first ever medallion free motion motif! What was I thinking?! I had to remind myself every few minutes that just like pebbles...this will look fantastic after a wash...and from a distance. Full disclosure comes with close ups. I think it's important not to sugar coat, disguise or hide the warts! The point is I tried! They say the more you do, the better you become or the easier free motion quilting gets. I have yet to get to that point, but I'll continue to try! The rest of the quilt was on all about geometric quilting. With my Hera marker I would map out a round. Quilt it. And repeat over and over. Picking points or corners helps with getting interesting angles when quilting. Once I was finished with that part I noticed that there open spaces that needed filling. I decided to go with the good old pebbles once more. We all love the fronts of quilts. 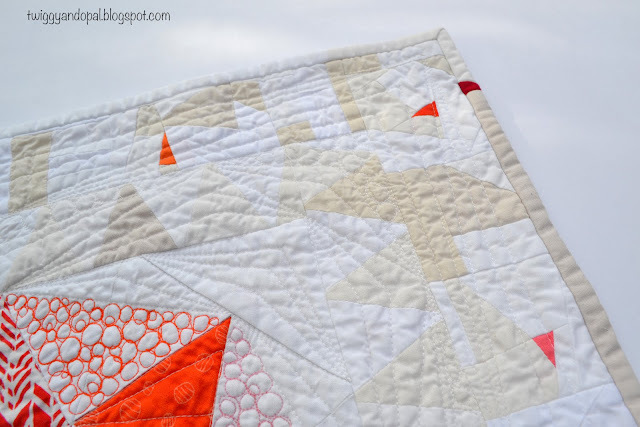 We even go so far as to pick busy backing prints to make our quilting hiccups less noticeable. I used Kona Ivory for the back and that meant no hiding anything! My plan or my hope was exactly what happened. The thread painting a picture, a medallion plus! Mindful of the shakiness of my quilting...it is pretty! The binding is scrappy with a few bits of the primary colors Red, yellow and blue. If it wasn't for those three amigos...we'd not have all our other beauties! 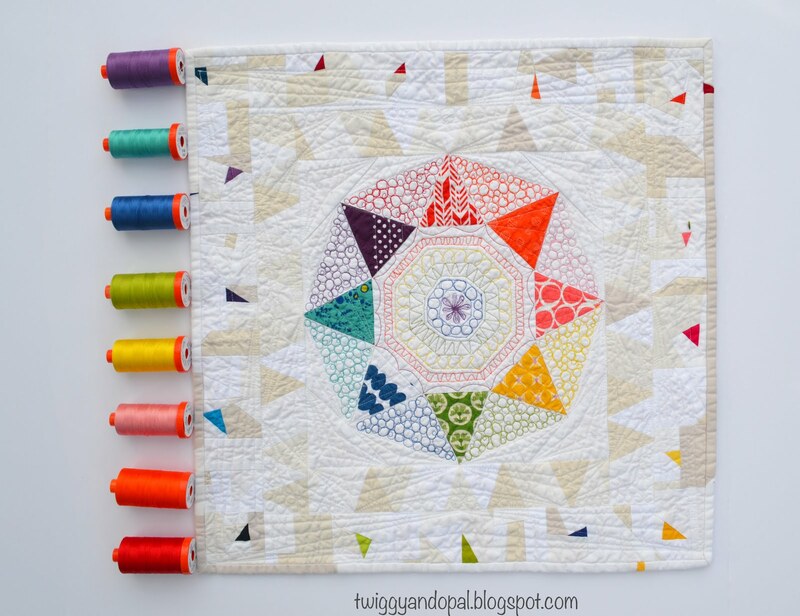 What's your favorite free motion quilting tip? Don't say practice, practice, practice!! I am too undisciplined to do that! My free tip is take it easy and slow at first, but don't be afraid to try! 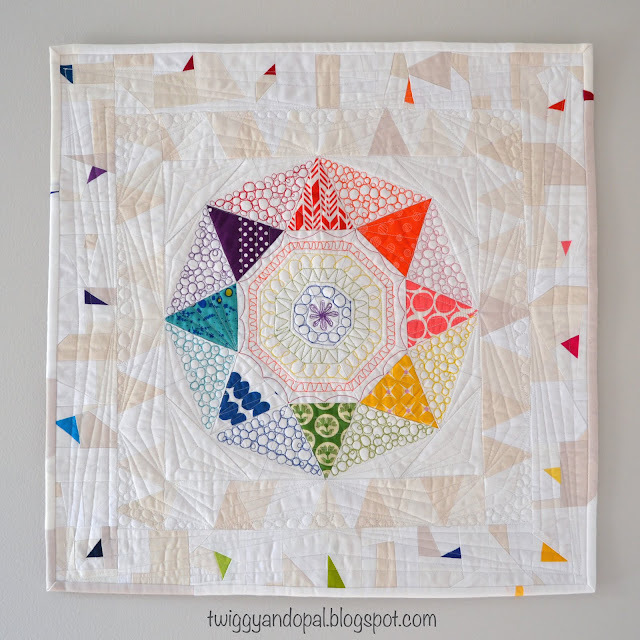 You can find the paper pieced pattern for the block here: 'Evening Star'. Jayne, this is wonderful! So fun to see up close, and to hear about your process. 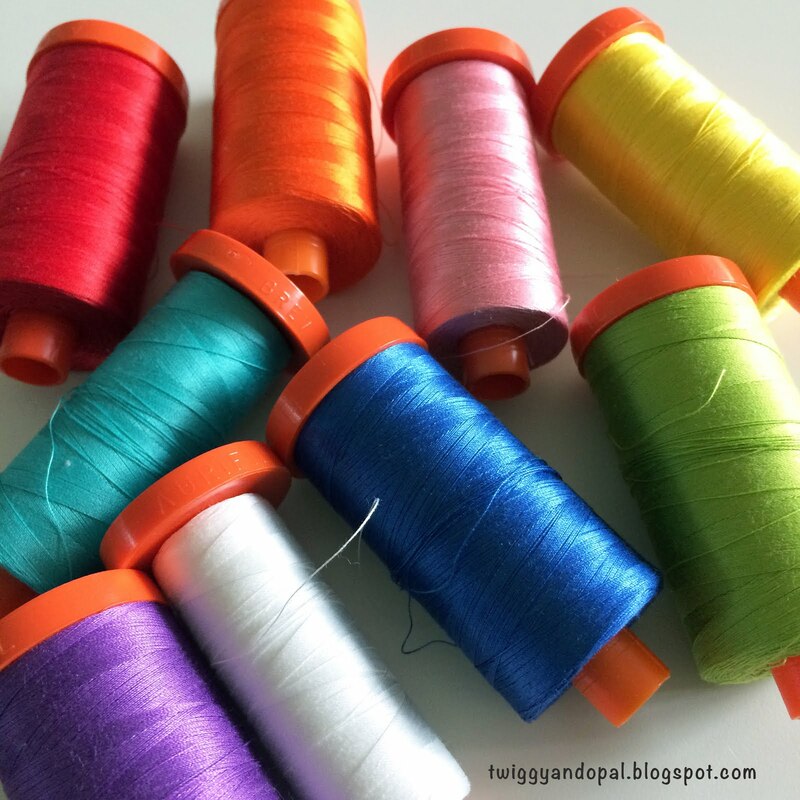 I love all the different colors of thread you used! I don't have a tip for you because I'm a chicken when it comes to trying FMQ, but you've inspired me with this beautiful project! I doubt I will ever become comfortable with my FMQ skills, but I’m trying! I was chicken too and can only say don’t be afraid to try it! I do believe we are our worst critics and I certainly am when it comes to FMQ! I really think it turned out beautifully, Jayne. The center just glows with color. I like that you echoed more pebbles in the outer area as you quilted the negative space. As for a tip, doodle. I know it sounds like practice, but to be honest, I don't do much more than doodle a bit of the design on paper before I start a motif myself anymore. That is good advice and it doesn’t resemble ‘practice’ too much for me! I’ll give it a try next time. For my first ‘medallion’ try, I couldn’t be happier though! I think you did a GREAT job on the quilting! Try not to be too critical of your work. Practice make BETTER!! LOVE the bits of color in the binding. TOO cute!! Wow, this is just so amazing!!! Even a little color in that binding! This looks like a lovely lacy embroidery in all the colors. Are you sure you didn't have a computerized design do it all? Honestly, it is a winner! Wow. I admire all you put into this one! My one tip is to set your speed at something that's comfortable for you, then press petal to the metal, so you don't have to think much about what your foot is doing. This really helps me. That, and not be too judgmental - the piece IS being made by a human! ie. don't expect perfection. I love your tip and do just that when I FMQ. It does help and gives me one less thing to think about during the process. I know I criticize my work harshly, it’s hard not to do when I see each little flaw along the way! My tip: Don't be afraid to have favorite FMQ motifs that you use again and again. If you're good at pebbles, pebble on everything! I'm a really good stippler and hook-swirler, so I use those a lot. But sometimes I catch myself thinking, Oh not stipple AGAIN! But it works for me. And besides, no one seeing one of my quilts knows that the last three had similar quilting. And the corollary: If you try a motif several times and it just isn't fun for you, give yourself permission to skip that one in the future. The curve of hearts and feathers are really hard for me, they get pointy instead of smooth fast. I strongly believe that we each have hand motions that are easy and hard, so capitalize on your strengths! I think this is the best advice I’ve heard in a long time! Thank you for that Louise. It makes total sense and something I’m going to practice when I do future FMQ! It isn’t often a piece of advice comes my way that gives me that light bulb moment, palm to the forehead and could be a game changer! Thanks for sharing with Oh Scrap! So much fun color and texture! Congrats on another spectacular finish! I appreciate your honesty in showing the "mess ups". It gives me a bit of courage that if I try it on my own, it doesn't have to be prefect to look nice. That is stunning work with the quilting. It looks wonderful. Beautiful! 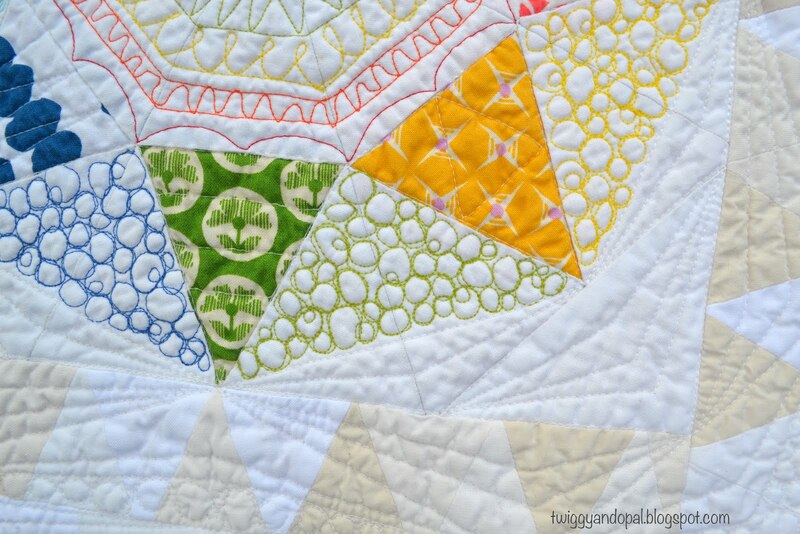 Love all the quilting motifs you used, even though you may have been out of your comfort zone it looks fantastic. Love the texture. I doodle a design first just to get the feel for it. Oh, gosh! You did a wonderful job if you ask me! In fact I think you've inspired me to be a little braver with my fmq. My biggest problem is I can never figure out what to quilt to begin with. I love your variety and color changes. Congrats on that finish. 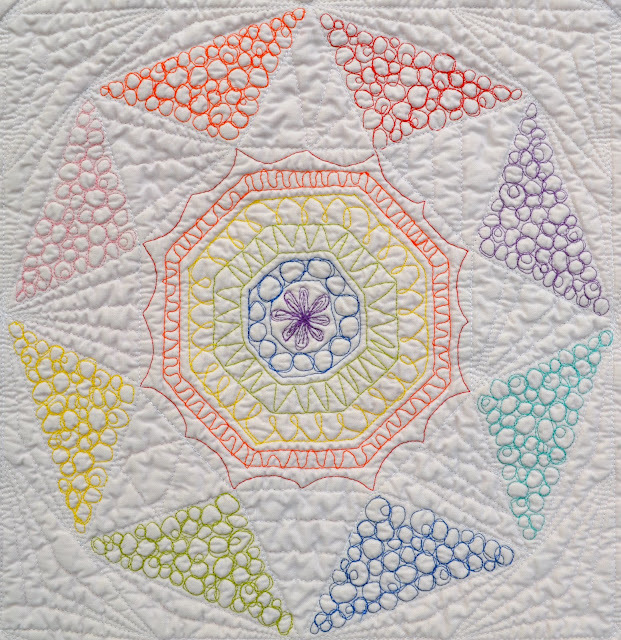 This is a quilt that definitely fulfilled its promise, and the great thing about you Jayne is you are never afraid to try. You always give everything your best shot and then share it with the world leaving yourself wide open to criticism. You have my utmost respect. Congratulations on trying new quilting designs on your projects ! You did a great job with this one ! I love this article Jayne and I love this quilt. 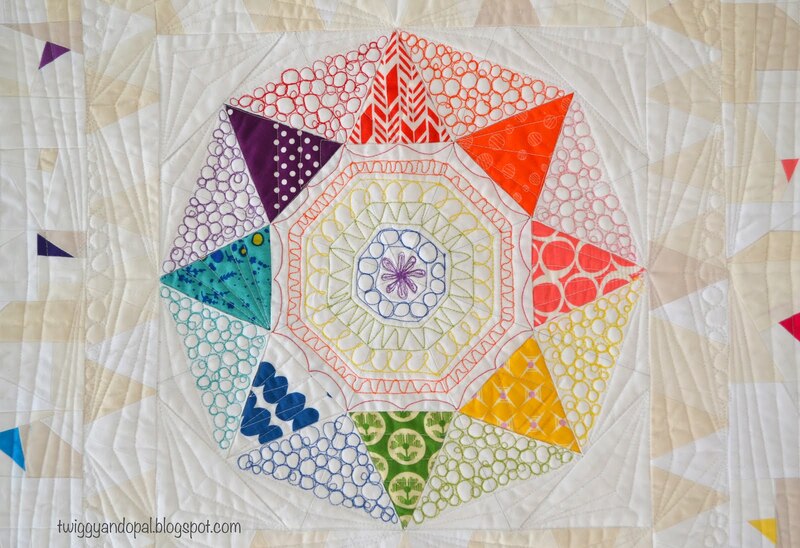 You have given me hope with my FMQ journey, to the point that I would like to make this quilt and give FMQ another try. Thank you so much. Hi Jayne, your piece is stunning. 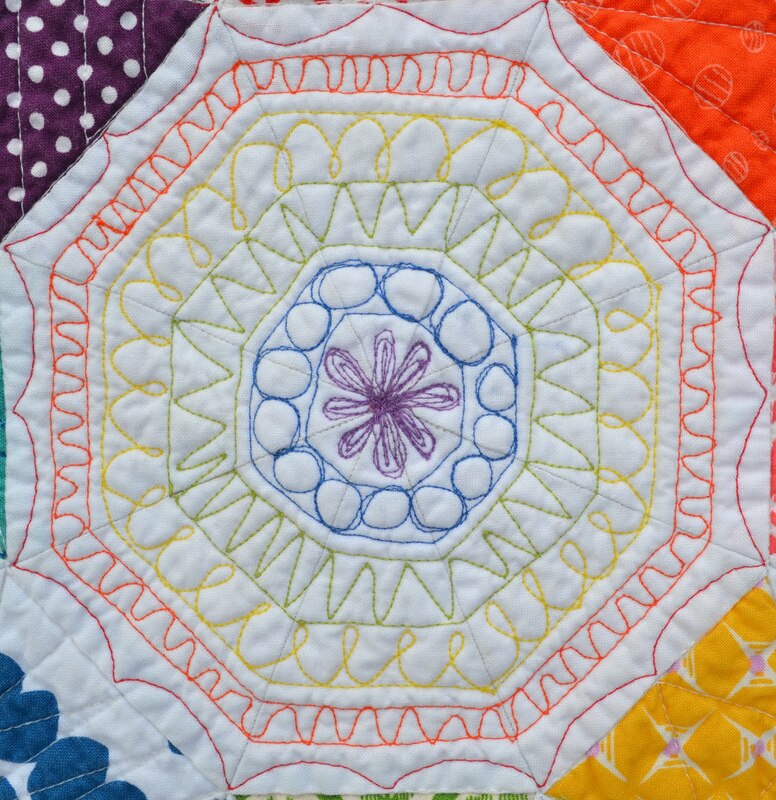 I've been wanting to FMQ with coloured thread on a white background, and it's actually this weekend's plan - coloured thread on a wholecloth quilt. Your work is very inspiring! Thanks. Wow. This is stunning. Your quilting is amazing. The point is, you succeeded! It's just gorgeous.